The leaves are turning and so is the weather. That means Halloween is just around the corner! I want to take the time to revisit a post of mine from a few years ago that’s been getting a lot of action on Pinterest and the web as well as many comments and questions. 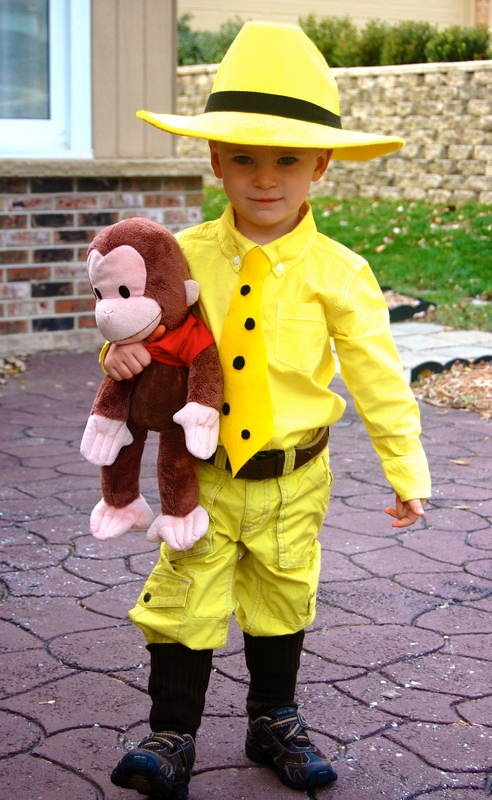 My little Curious George lover was the Man with the Yellow Hat when he was three. It was my version of a homemade costume (which means no sewing!). So today I will share with you how I put this together! For the outfit: I looked everywhere for a bright yellow shirt and came up with nothing. That’s when I decided to try my first turn and dying clothes. So much fun! I bought a white oxford shirt and very light khaki pants from Old Navy (white would be better but was hard to find in the fall, and for boys!). Shirt can be found here. Similar pants found here. Following the directions on the package, I used yellow Rit Dye to turn both pieces the bold yellow I was looking for. I used my husband’s brown socks and hiked them up over the pants, pairing them with his brown shoes. Debate on brown or black can happen between the book and the show, but I went old school. I’m a writer and a purist, what can I say? For the hat: The hat is actually what I would call an adult pimp hat from a local Halloween store. Or perhaps some would call it a cowboy hat. Either way, I took black ribbon and adhered it to the hat with tacky glue. Now, because the hat was adult-sized, I glued in some foam pieces on either side above the ears to make it a bit more snug. Worked like a charm! If you’re more inclined to make it taller, here is a Pinterest tutorial for making your own (from Molly Sews). For the tie: Again, I don’t sew. So for the tie, I freehand drew an outline of a tie and cut it with felt. I cut black polka dots and stuck them to the tie with tacky glue. I then pinned the tie to the shirt with a safety pin. Once little Lincoln picked up George, all he needed to do was say, “Now be a good little monkey…” and the costume was complete! I hope this helps and that you and your little ones have a wonderful Halloween!